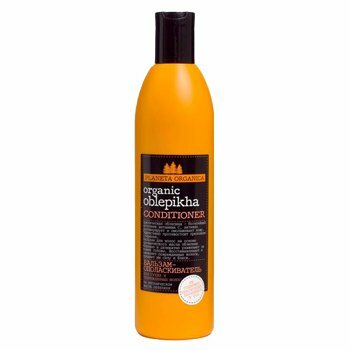 Organic Oblepikha Hair Conditioner is produced by the Russian beauty brand Planeta Organica. It is specifically designed for dry and damaged hair. The product is formulated with organic sea buckthorn oil (“oblepikha” is actually the Russian word for sea buckthorn). It gently and delicately cares for the scalp, helps to restore hair structure damaged by dehydration, dyeing, hot-styling. The conditioner makes your hair stronger and shinier, stimulates its growth. Free of SLS (sodium lauryl sulfate) and parabens. Packaged in a stylish bottle. Want to buy Organic Oblepikha Hair Conditioner? Call us or submit your order via our web site!